I’ve been on a roll lately, reading books that make me cry. The latest? 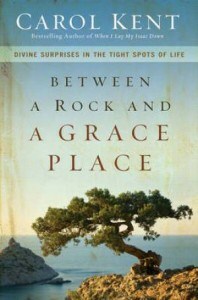 Between A Rock and A Grace Place: Divine Surprises in the Tight Spots of Life. We’ve all got issues, we all face adversity…but how do we deal with it? If we deal with it like Carol Kent, we maintain our dignity, grace, as well as our faith, in spite of the challenges that seem overwhelming. Kent is the mother of a man who is spending his life in prison. She (and her husband) handled their circumstances with great aplomb — that’s not to say that it wasn’t difficult, because it was tremendously devastating for them. But they did not abandon their faith or their God; in fact, they espoused their faith in every segment of their daily life. Upon learning that her son had been rushed to an undisclosed hospital (as a maximum security inmate, his parents were not permitted to know his location for security reasons) for emergency surgery after his appendix burst, Kent was distraught that she was not permitted to see him. However, in a subsequent letter, Jason informed his parents that “Nurse Betty” had treated him so compassionately, so kindly, that he felt as though she was treating him like her son. This is but one example of how Kent’s faith comforts her and allows her to see life on terms that complement her faith. While there are moments — in Kent’s life as well as ours — where jealousy, self-pity, and resentment rear their ugly heads, they can be overcome with gratitude, simplicity, and contentment. These are the kinds of lessons that made me tear up, and that I did often. Each chapter concludes with questions to foster reflection, self-discovery, and change. Trust me, Between A Rock and A Grace Place is a book you will not put down…nor will you forget it and its powerful message. This sounds like a good book. This is the kind of book I like reading reviews about. I love learning about how other people deal with things when they have The Lord in their hearts. Thanks for the review!